Definition at line 13 of file CMathTrigger.h. Definition at line 165 of file CMathTrigger.cpp. Definition at line 172 of file CMathTrigger.cpp. Definition at line 180 of file CMathTrigger.cpp. Initialize all values of the math model with their initial values. Definition at line 183 of file CMathTrigger.cpp. Calculate the current trigger value. Definition at line 207 of file CMathTrigger.cpp. Determine the activity for the initial conditions. Determine the true value for the initial conditions. Definition at line 195 of file CMathTrigger.cpp. Definition at line 212 of file CMathTrigger.cpp. References CExpression::compile(), CEvaluationTree::getRoot(), CEvaluationNode::isBoolean(), mFunctionVariableMap, mRootFinders, mTrueExpression, CExpression::setInfix(), and CEvaluationTree::setRoot(). Referenced by CMathEvent::compile(), compileAND(), compileEQ(), compileEXPRESSION(), compileFUNCTION(), compileNOT(), compileOR(), compileVARIABLE(), and compileXOR(). 223 // This is a boolean expression thus the root node must be a logical operator. Definition at line 257 of file CMathTrigger.cpp. References CEvaluationNodeLogical::AND, CEvaluationNodeVariable::ANY, CEvaluationNode::CALL, compileAND(), compileEQ(), compileEXPRESSION(), compileFUNCTION(), compileGE(), compileGT(), compileLE(), compileLT(), compileNE(), compileNOT(), compileOR(), compileVARIABLE(), compileXOR(), CEvaluationNode::CONSTANT, CEvaluationNodeLogical::EQ, CEvaluationNodeCall::EXPRESSION, CEvaluationNodeConstant::FALSE, CEvaluationNodeCall::FUNCTION, CEvaluationNode::FUNCTION, CEvaluationNodeLogical::GE, CEvaluationNode::getType(), CEvaluationNodeLogical::GT, CEvaluationNodeLogical::LE, CEvaluationNode::LOGICAL, CEvaluationNodeLogical::LT, CEvaluationNodeLogical::NE, CEvaluationNodeFunction::NOT, CEvaluationNodeLogical::OR, CEvaluationNode::subType(), CEvaluationNodeConstant::TRUE, CEvaluationNode::type(), CEvaluationNode::VARIABLE, and CEvaluationNodeLogical::XOR. Definition at line 390 of file CMathTrigger.cpp. References CCopasiNode< _Data >::addChild(), CEvaluationNodeLogical::AND, compile(), CCopasiNode< _Data >::getChild(), and CCopasiNode< _Data >::getSibling(). Referenced by compile(), and compileEQ(). Definition at line 459 of file CMathTrigger.cpp. References CCopasiNode< _Data >::addChild(), CEvaluationNodeLogical::AND, compile(), compileAND(), copyBranch(), CEvaluationNodeLogical::EQ, CEvaluationNodeLogical::GE, CCopasiNode< _Data >::getChild(), CCopasiNode< _Data >::getSibling(), CEvaluationNode::getType(), CEvaluationNode::LOGICAL, pdelete, and CEvaluationNode::type(). 467 // Equality can be determined between Boolean and double values. 472 // Create a temporary expression and compile it. Definition at line 680 of file CMathTrigger.cpp. Definition at line 649 of file CMathTrigger.cpp. 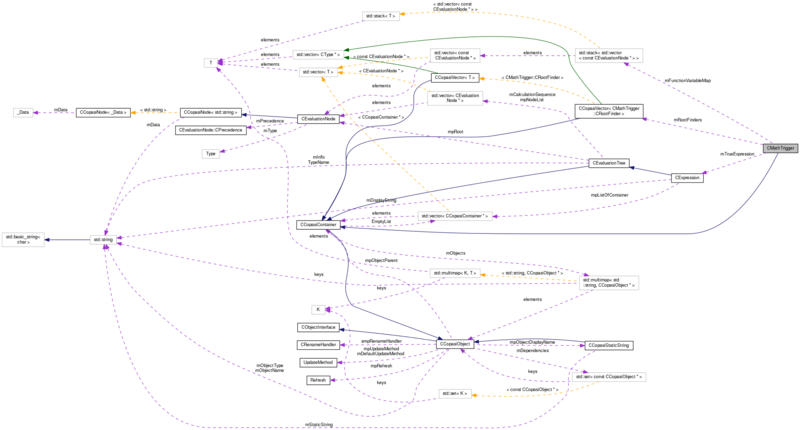 References compile(), CEvaluationNodeCall::getCalledTree(), CCopasiNode< _Data >::getChild(), CEvaluationTree::getRoot(), CCopasiNode< _Data >::getSibling(), CEvaluationNode::isBoolean(), and mFunctionVariableMap. Definition at line 582 of file CMathTrigger.cpp. References CCopasiNode< _Data >::addChild(), copyBranch(), CCopasiNode< _Data >::getChild(), CCopasiNode< _Data >::getSibling(), CMathTrigger::CRootFinder::getTrueExpression(), CMathTrigger::CRootFinder::mEquality, CEvaluationNodeOperator::MINUS, CMathTrigger::CRootFinder::mRoot, mRootFinders, and CEvaluationTree::setRoot(). Definition at line 607 of file CMathTrigger.cpp. Definition at line 532 of file CMathTrigger.cpp. Definition at line 557 of file CMathTrigger.cpp. Definition at line 507 of file CMathTrigger.cpp. References CCopasiNode< _Data >::addChild(), compileNOT(), CEvaluationNode::copyBranch(), CEvaluationNodeLogical::EQ, CCopasiNode< _Data >::getChild(), CCopasiNode< _Data >::getSibling(), and CEvaluationNodeFunction::NOT. 515 // We treat this as NOT and EQ. 516 // For this we create a modified copy of the current node. Definition at line 632 of file CMathTrigger.cpp. References CCopasiNode< _Data >::addChild(), compile(), CCopasiNode< _Data >::getChild(), and CEvaluationNodeFunction::NOT. Referenced by compile(), and compileNE(). Definition at line 413 of file CMathTrigger.cpp. References CCopasiNode< _Data >::addChild(), compile(), CCopasiNode< _Data >::getChild(), CCopasiNode< _Data >::getSibling(), and CEvaluationNodeLogical::OR. Definition at line 692 of file CMathTrigger.cpp. References compile(), CEvaluationNode::isBoolean(), and mFunctionVariableMap. Definition at line 436 of file CMathTrigger.cpp. References CCopasiNode< _Data >::addChild(), compile(), CCopasiNode< _Data >::getChild(), CCopasiNode< _Data >::getSibling(), and CEvaluationNodeLogical::XOR. Definition at line 708 of file CMathTrigger.cpp. References CEvaluationNodeConstant::_NaN, C_INVALID_INDEX, CEvaluationNode::copyBranch(), CCopasiNode< _Data >::getData(), CEvaluationNode::getType(), mFunctionVariableMap, and CEvaluationNode::VARIABLE. Referenced by compileEQ(), compileGE(), compileGT(), compileLE(), and compileLT(). 724 // variable name and value NaN. Definition at line 252 of file CMathTrigger.cpp. Definition at line 256 of file CMathTrigger.h. Referenced by compile(), compileFUNCTION(), compileVARIABLE(), and copyBranch(). A vector containing the root expression. Definition at line 250 of file CMathTrigger.h. Referenced by applyInitialValues(), calculateTrueValue(), compile(), compileGE(), compileGT(), compileLE(), compileLT(), and getRootFinders(). This expression evaluates whether the trigger value is true. Definition at line 245 of file CMathTrigger.h. Referenced by calculate(), and compile().